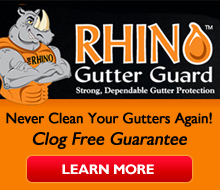 A clogged gutter is one of the most serious home problems that any homeowner can ever encounter. Remember that there are types of gutter guards that work also and we can tell you which ones will work on your home. 2 types we like are Rhino & Easy On Gutter Surgical Stainless Steel Micro Mesh. If not attended to properly, it will lead to many house damages that will really hurt your pocket. Incorporating a gutter guard or a leaf guard to your existing gutter system can save you a great deal of heart ache from facing extremely expensive repair and replacement costs that a clogged gutter may cause you. It’s a very smart investment and its effects will definitely be more felt and appreciated in years to come. So, what makes Gutter Guard a smart investment? First of all, it is considered an effective first line of defense in preventing leaves, seeds, bird droppings, twigs and dirt from going inside your gutters and draining waterways. It is definitely a protection system that will keep environmental debris from forming nasty clogs that will therefore allow gutters to work properly. Next, it significantly reduces the risk of house damages like basement flooding, mold build-up or rotting foundation since they help the gutters in directing rainwater away from houses by preventing formation of clogs early on. Lastly, gutter guards are commonly designed to keep gutters “almost” maintenance free. A lot of gutter providers claim that their gutter guards don’t necessitate regular cleaning because nothing will pass through them so there won’t be anything to clean inside. In case you didn’t notice, I placed a little emphasis on the word “almost” right up there. I guess, what I’m trying to say is that a gutter guard will help you in cutting down regular cleaning costs. It is still advisable to have the gutters checked at least once in a while. We will do it for FREE for you! These are just some of the reasons why gutter guards make a smart home improvement investment. Having one installed will cost you big time at first but that will definitely pay off in the long run because it guarantees assistance in preserving and increasing the value of your homes. If you pick our Surgical Stainless Steel brands you won’t even have to check your gutter ever again! Ask for Rhino Guard or Easy On for your best protection. No Replies to "What Makes Micro Mesh Gutter Guards a Smart Investment"